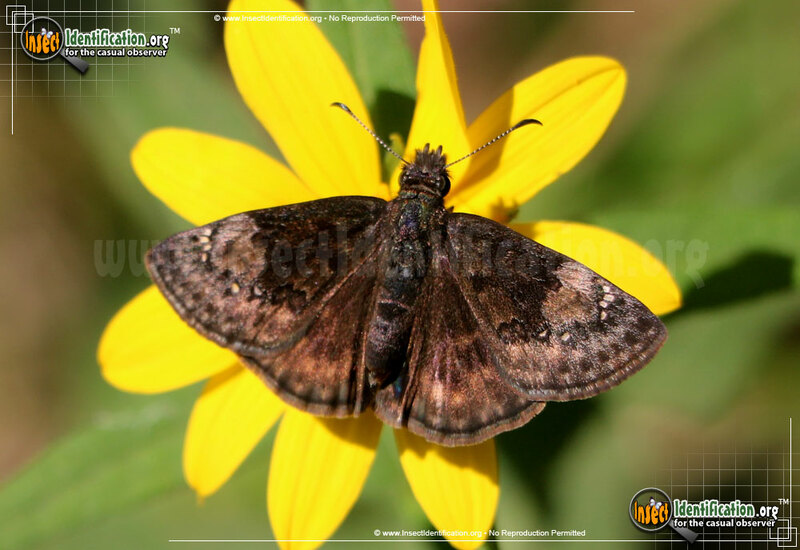 Detailing the physical features, habits, territorial reach and other identifying qualities of the Columbine Duskywing. The delicate, colorful columbine flower is a favorite food and hangout for northern Columbine Duskywing adults and caterpillars. Columbine Duskywings are found along the states and provinces that border Canada and the U.S.. They are dark brown with four small white spots near the edge of the forewings and two more spots that are closer to the midline. They are similar in appearance to Wild Indigo Duskywings, whom share southern parts of their range. Females lay a round fertilized egg on the leaf of columbines. Caterpillars have black heads and green fleshy bodies covered in a veil of yellow dots, giving them an overall yellow appearance. Two or three broods can be produced each year. Larvae eat the leaves of wild columbine flowers and adults drink the flower's nectar. Look for active adults in spring through fall in meadows, ravines, roadsides and rocky areas where columbines grow.